I imagine being an astronaut is a high-stress occupation. Despite being quite literally a dream job for many at NASA, there’s no question that every launch requires a thousand things to go right, and anything that goes wrong can mean serious trouble. With that kind of pressure, you almost have to have a sense of humor to lighten the atmosphere now and then. 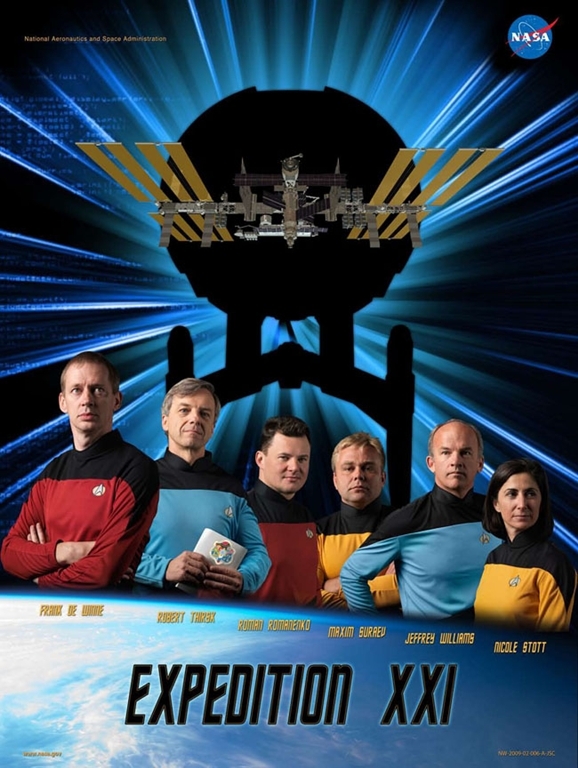 Apparently, one way the NASA folks blow off some steam is by creating silly posters for the individual missions that reference everything from Star Trek to The Matrix to Harry Potter. Could One Of Neptune’s Moons Be Hiding A Subsurface Ocean? Mankind’s exploration of space has revealed lots of interesting discoveries over the years about the composition of our solar system and how it evolved into its current, relatively stable, state. For all this examination of the planets and asteroids, you can boil most planetary exploration these days down to one thing: the search for possible life-bearing environments, either in the present or earlier in our solar system’s history. Now we can add one more location of interest to that search, as a group of researchers think there may be a subsurface ocean on Neptune’s largest moon, Triton. Neptune and its moons are probably one of the last places you’d think of when it comes to extraterrestrial life. The planet orbits roughly 30 AU from the sun; that’s 30 times the distance from the Earth to the Sun. At this distance, Neptune’s largest moon, Triton, has an average surface temperature of −235 °C, so there’s zero chance of little green men living on its surface, no matter how comfy their sweaters may be. But all hope is not lost for the frozen moon. According to Universe Today, a research team at the University of Maryland believes that, through a process known as tidal heating, Triton could be hiding an ocean underneath its frigid surface. Saswata Hier-Majumder, of the university’s Dept. of Geology, is cautiously optimistic about the study’s claims. These days, it seems like its easier to find alien planets hundreds of lightyears away than to get funding for space research here on Earth. When your space research happens to be the search for extraterrestrial signals from outer space, that funding can be even more elusive. It’s become so elusive that SETI superstar Jill Tarter has “retired” from the hunt for alien life in an effort to dig up more sources to fund the potentially reality altering mission. Thanks to a generous donation by a space outreach organization with a unique business model, the SETI Institute has hit its first payday in the search for terrestrial funding. Uwingu is a company whose entire aim is to raise money for all types of space science and research. Through Indiegogo funding drives and an unnamed product that will “game-ify space” (a concept that has proven its worth with Zooniverse), Uwingu plans to generate cash flow directly into the space science and technology projects that could use it. Just last Wednesday, the company announced that fundraising was going so well they would be able to start donating money ahead of schedule, with the first wad of cash going to none other than the SETI Institute. In the announcement, SETI’s Jill Tarter talked about how important Uwingu’s mission and funding are to future of space science. Mankind may have walked on it, zoomed around it, and thrown satellites into its surface, but the moon still has her secrets. One of the mysteries that has perplexed scientists for quite a while has been mysterious milky white blotches on the moon’s surface that correspond with small magnetic fields that should be too weak to have any effect on the lunar soil. Now a group of scientists think they may have discovered the reason for the moon’s discoloration and understanding it could hold the key to keeping astronauts safe from radiation on long space flights. While the Earth has a magnetic field that encompasses it, keeping us safe from the massive amounts of radiation that the sun can put out, our moon has no global defense against solar flares and cosmic rays. In a lot of areas, constant exposure to solar radiation has charred the lunar soil to a much darker shade of grey (not to be confused with the dark lunar maria that can be seen from earth which are the remnants of ancient lava plains). When scientists saw white blotches on the sun-baked surface that couldn’t be accounted for by lunar impacts, they had no idea what caused them until the Apollo program. With Apollo came the understanding that each of these white blotches were surrounded with extremely weak magnetic fields, fields so weak that they shouldn’t have any effect on the coloration of the surface. That mystery has remained for years, but a team looking into radiation shielding for spacecraft may have just figured out the answer. Russia was the first country to “officially” get into the space tourism business, and has given quite a few billionaires their dream vacation aboard the International Space Station. While they have supposedly made a pretty penny for their efforts, at $20-$30 million a pop, it’s a little hard to attract a steady stream of clients. Seeing the success of Virgin Galactic in getting seats filled, one Russian company has decided to emulate them by building a new space plane that will launch at high altitude from another jet. If that sounds suspicious to you, it may be because this is the very same company that ripped off the space shuttle. The NPO Molniya Design Bureau was created in ’70s to build the Soviet Union’s extremely familiar-looking space shuttle, Buran. It has long been suspected, but never confirmed, that the Buran was a product of Cold War espionage. While the Buran only ever had one flight to space in 1988 before the program was cancelled, it did make history as the first and only space-plane-type craft to make a completely autonomous flight, orbit, and landing until the U.S. Air Force’s X-37b made its maiden voyage in 2010. Since then Molniya has mostly worked on guided weapons and had a short stint working on the secret Spiral space plane program before it was cancelled (which was, in itself, suspiciously similar to the work the U.S. was doing on the X-20 Dyna-Soar lifting body design; it seems originality just isn’t a hallmark of these guys’ work).